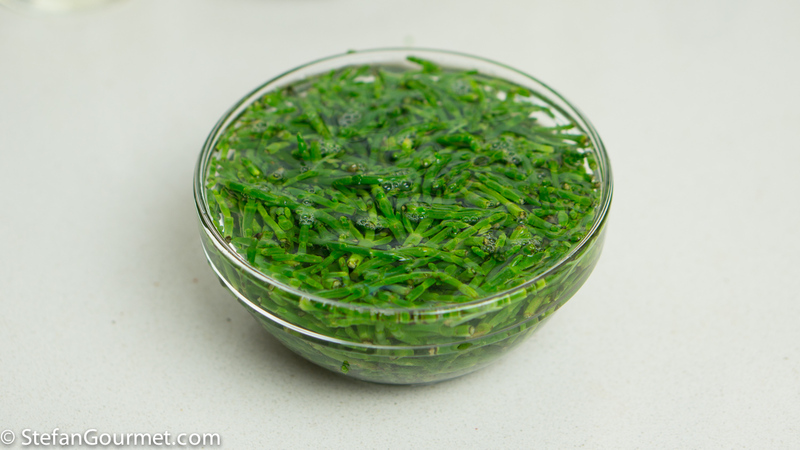 Samphire has been an easily available ingredient around here for years, but I haven’t been using it very often. As it is such a local ingredient to me, it had not occurred to me to use it in Italian cooking. That is, until I saw Marina of Le Ricette di Baccos using it for a pasta dish with shrimp. She refers to samphire as ‘sea asparagus’ (asparagi di mare) or salicornia. 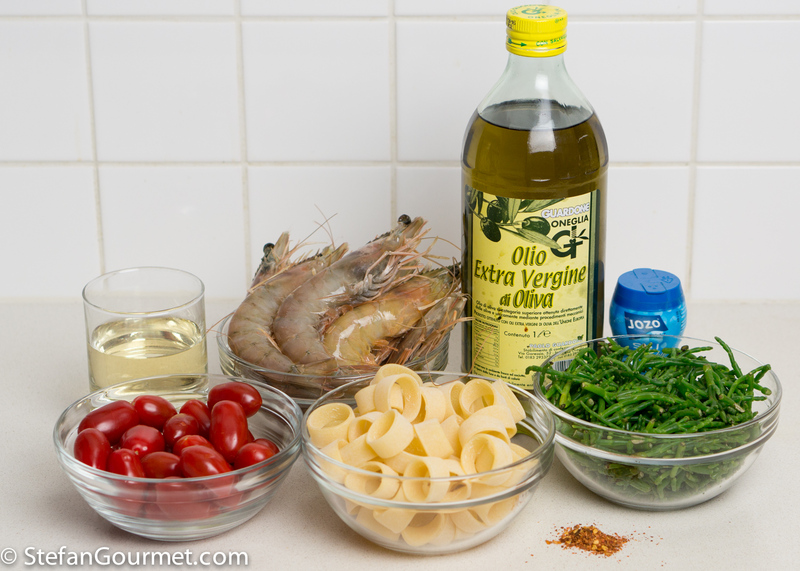 I made something very similar to her paccheri con gamberoni e asparagi di mare, with cherry tomatoes and a stock made from the heads and shells of the shrimp. 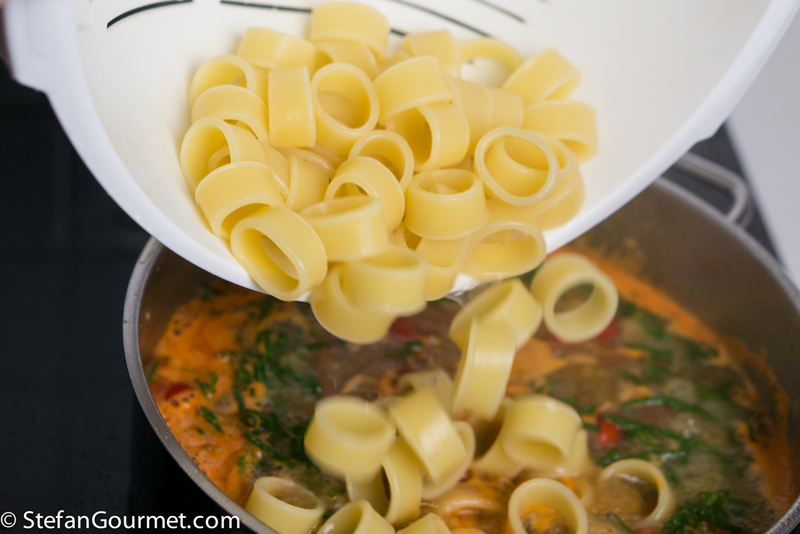 For the pasta I used calamarata, which get its name because it resembles rings of calamari. It was a really nice dish. Grazie, Marina! In our upcoming travels to Italy we are going to meet up with Marina, and I am really looking forward to that. 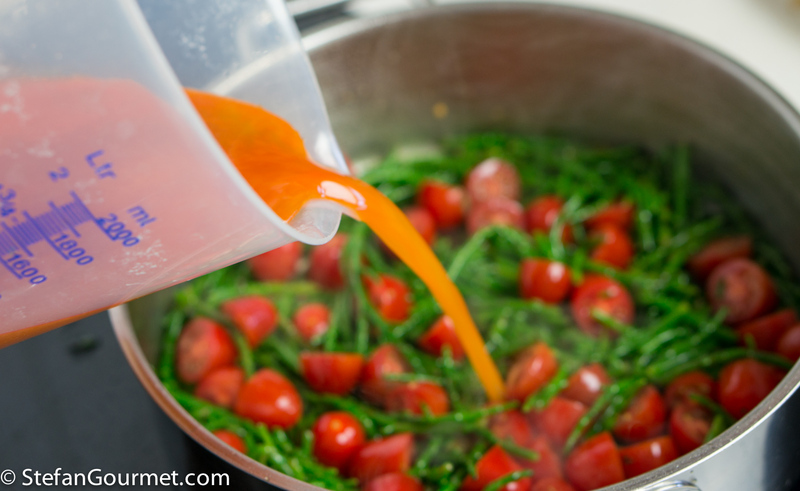 Soak 150 grams (.33 lb) of samphire in cold water (to remove a bit of the saltiness). Peel 500 grams (1.1 lb) of jumbo shrimp, reserving the heads and shells. 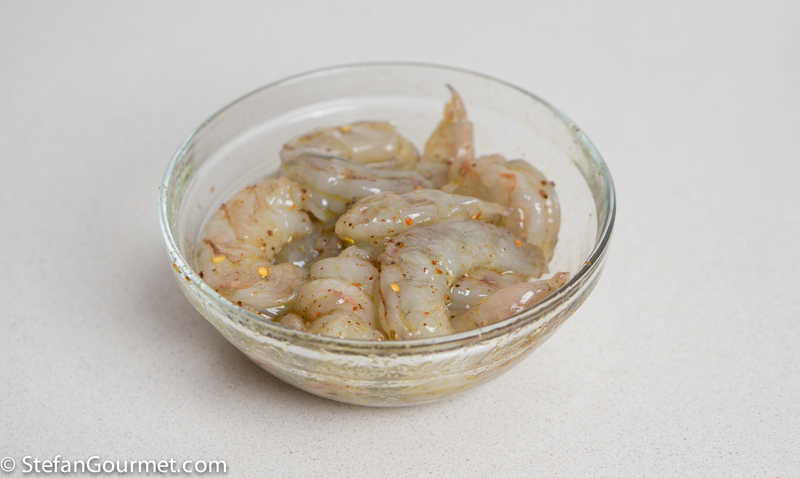 Add a tablespoon of olive oil, 1/2 tsp of chilli flakes, and 1/2 tsp of salt to the shrimp. Mix and allow to marinate for about half an hour. 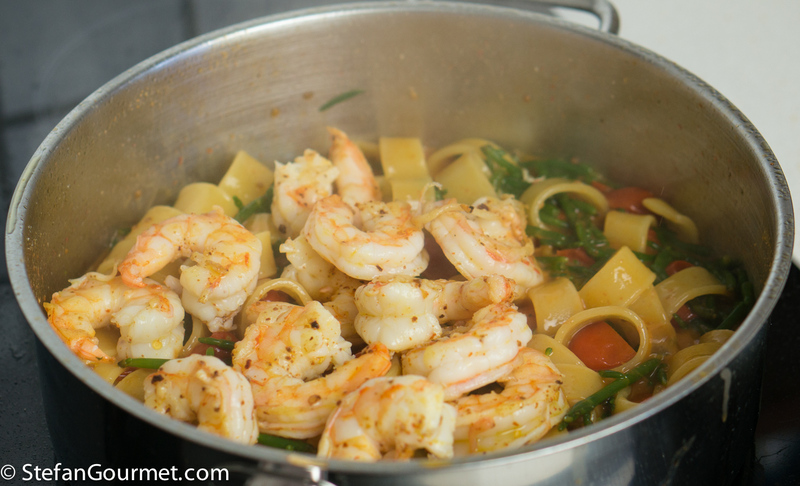 Meanwhile, heat a tablespoon of olive oil in a frying pan and add the reserved shrimp heads and shells. Stir over medium high heat until they are pink all over. 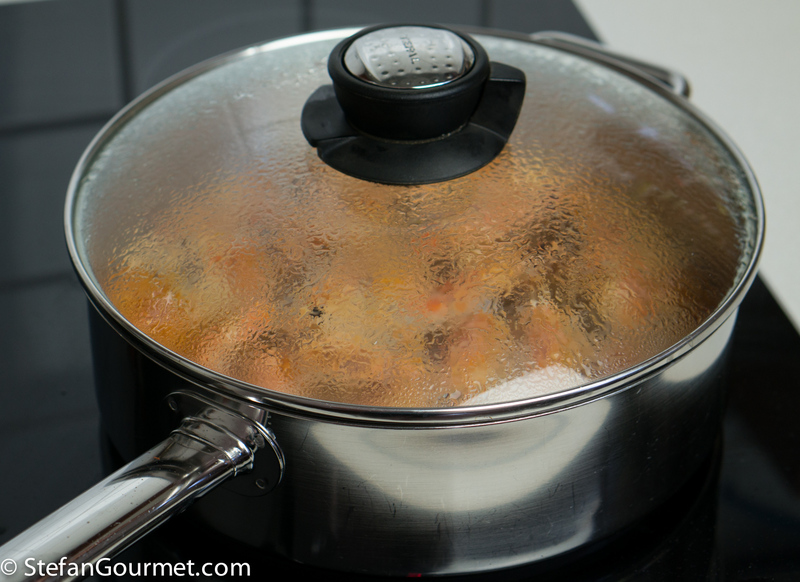 Bring to a boil, then cover and reduce the heat to a simmer, and allow to simmer for 20 minutes. 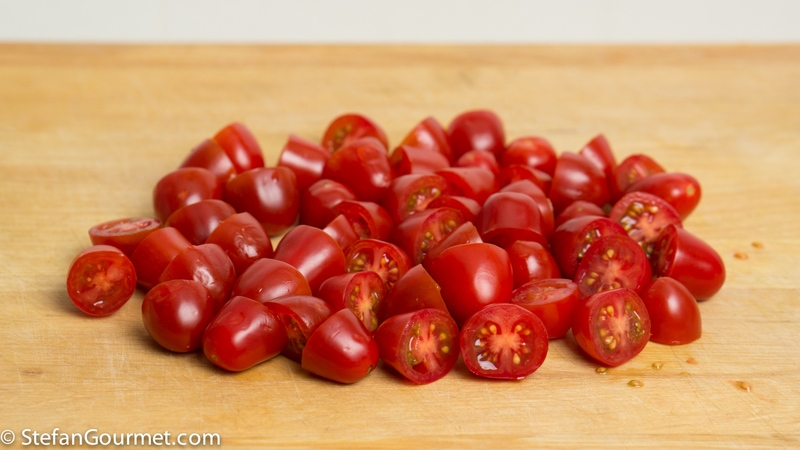 Meanwhile, cut 250 grams (.55 lb) of cherry tomatoes in half. Bring a pot of water to a boil. 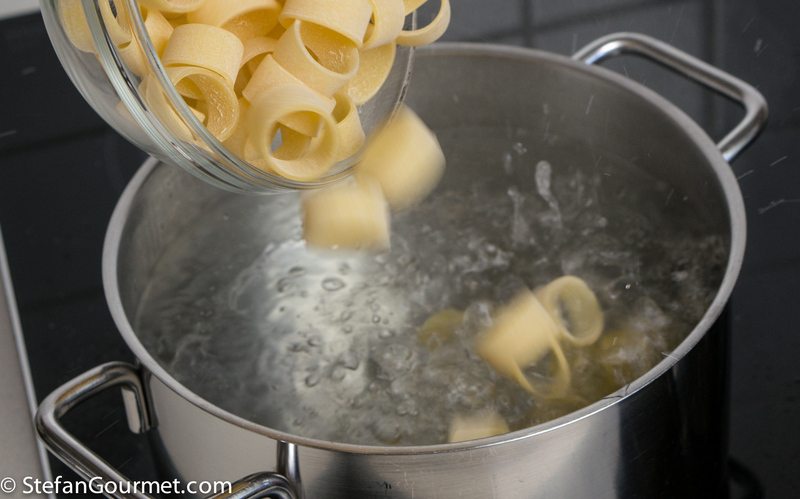 Add salt and 150 grams (.33 lb) of calamarata, mezze maniche, paccheri, or other short pasta. Set the timer for 2 minutes less than the time indicated on the package for al dente. 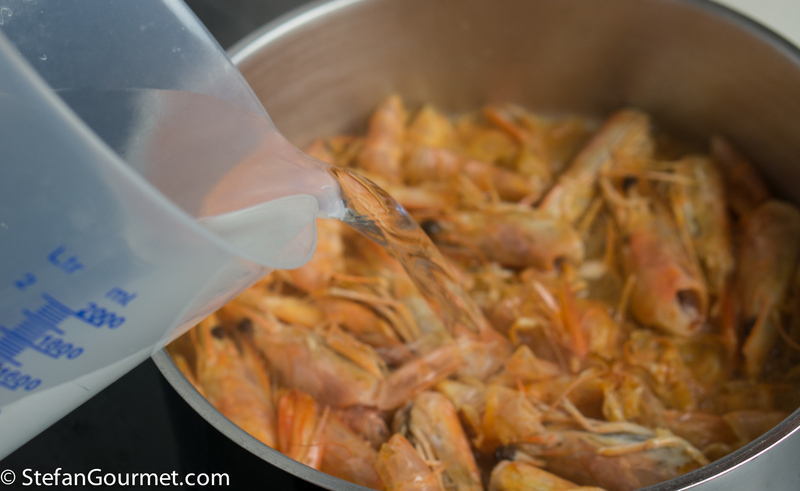 When the shrimp shells have simmered for 20 minutes, strain the shrimp stock and push down on the shrimp heads to squeeze as much flavor out of them as possible. I like to use a chinois and a pestle to do this job. Heat a tablespoon of olive oil in a frying pan. Add the marinated shrimp and cook over high heat for 30 seconds per side. 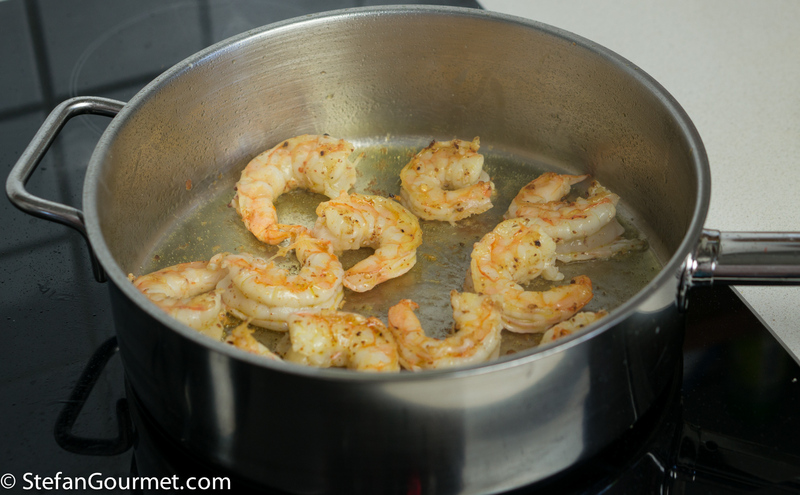 Take the shrimp out of the pan and set aside. 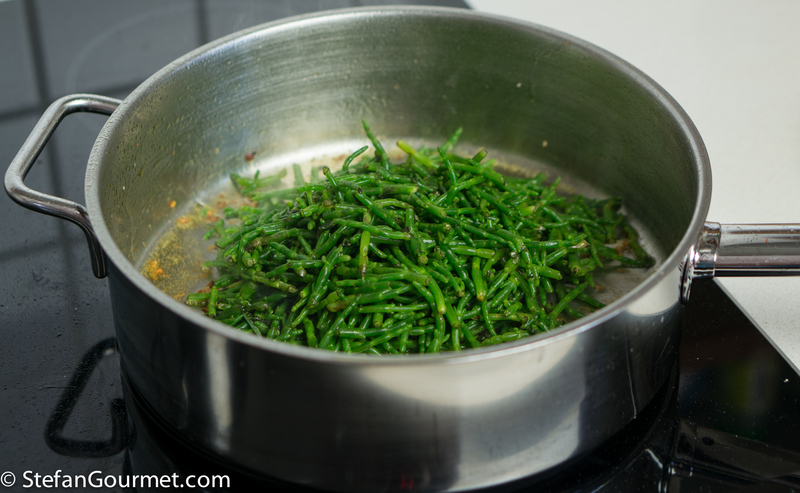 Drain the samphire and add to the pan. Stir for a minute. 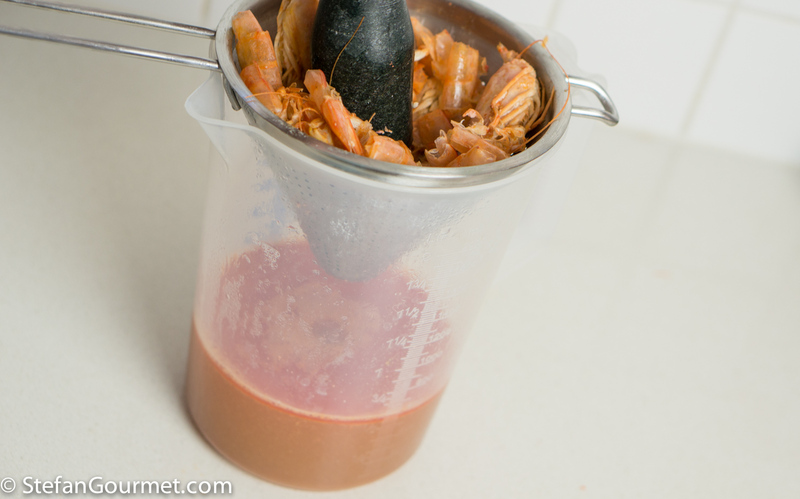 Add 240 ml (1 cup) of the shrimp stock. 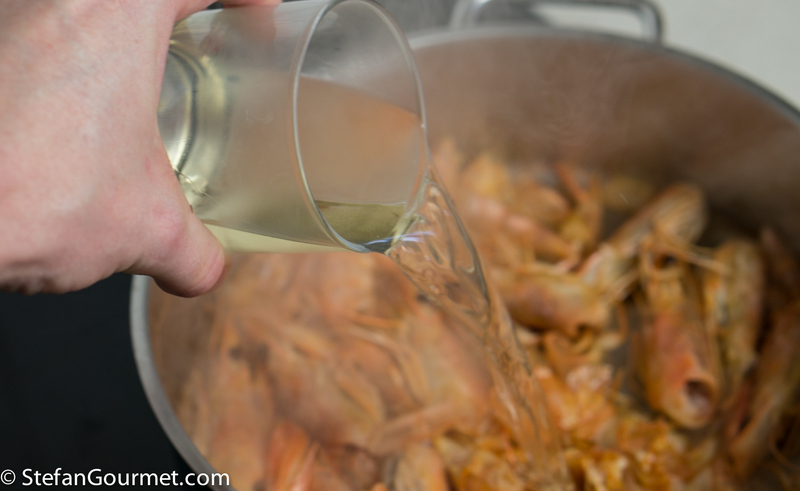 Reserve the remaining shrimp stock for another use (such as risotto); it freezes well. 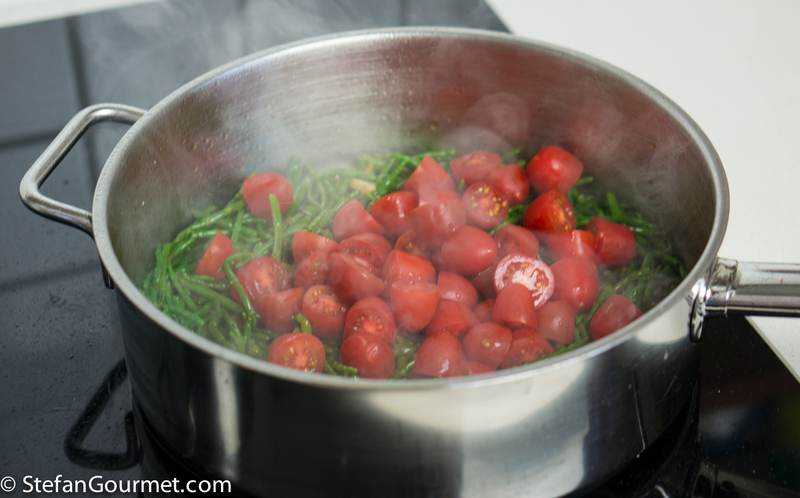 2 minutes before the pasta is al dente, drain and add to the pan with the samphire, tomatoes, and shrimp stock. 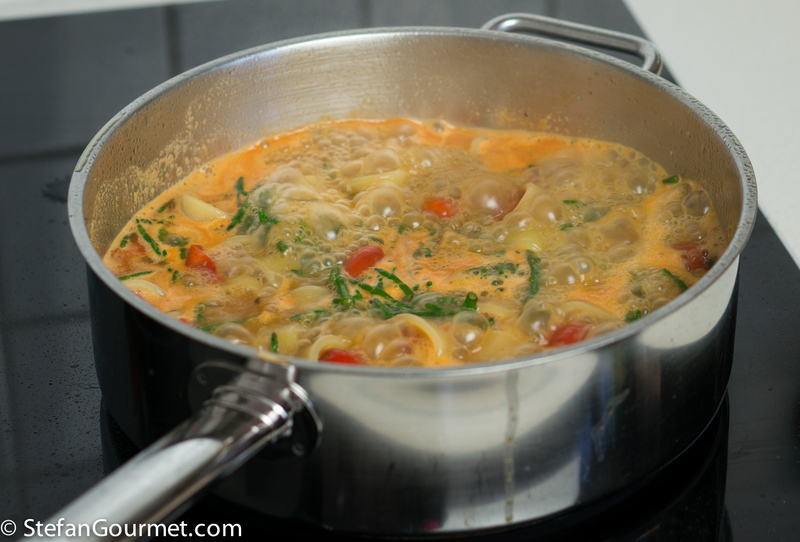 Cook for 2 minutes, stirring carefully to prevent mashing the tomatoes, until the pasta is al dente and most of the shrimp stock has been absorbed. 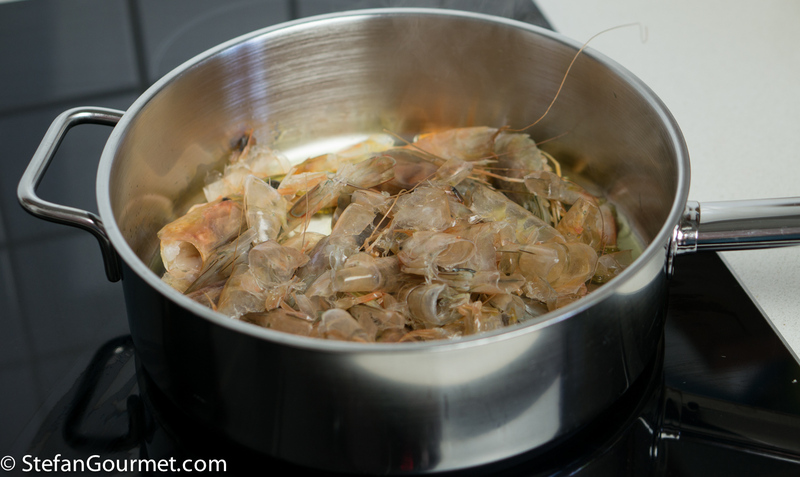 Now add the shrimp and allow them to warm through for a minute over low heat. Serve on preheated plates. Do not even think about adding grated parmigiano. This is great with many Italian whites. Perhaps the best choice would be a Vermentino from either Liguria or Sardinia, but a Soave or a Greco di Tufo would also be very nice. Marina recommends a Ribolla Gialla or a Malvasia from Istria. 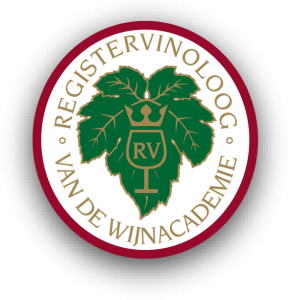 I don’t know that wines yet — although that is about to change! –, but Marina knows her wines so those are certainly recommended as well. 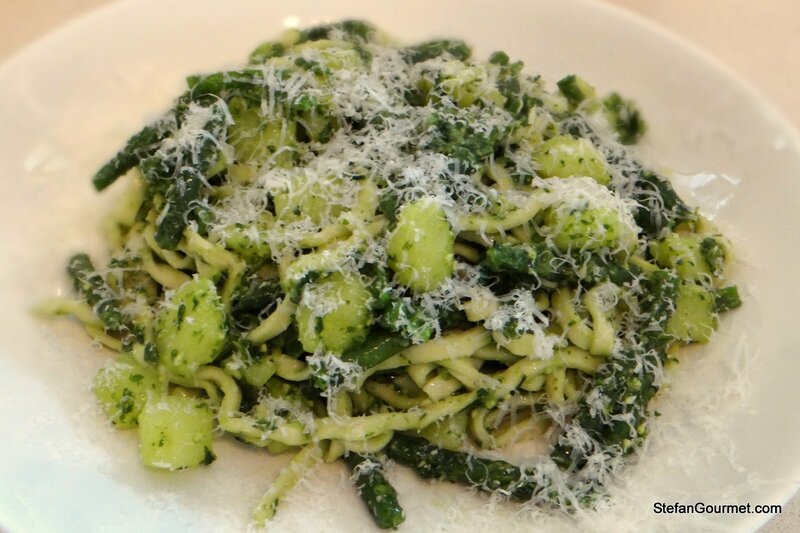 Trenette alla Genovese is fresh pasta cooked with haricots verts and potatoes, and served with pesto alla genovese. A delicious summery pasta dish from Liguria. Mm this looks good!! 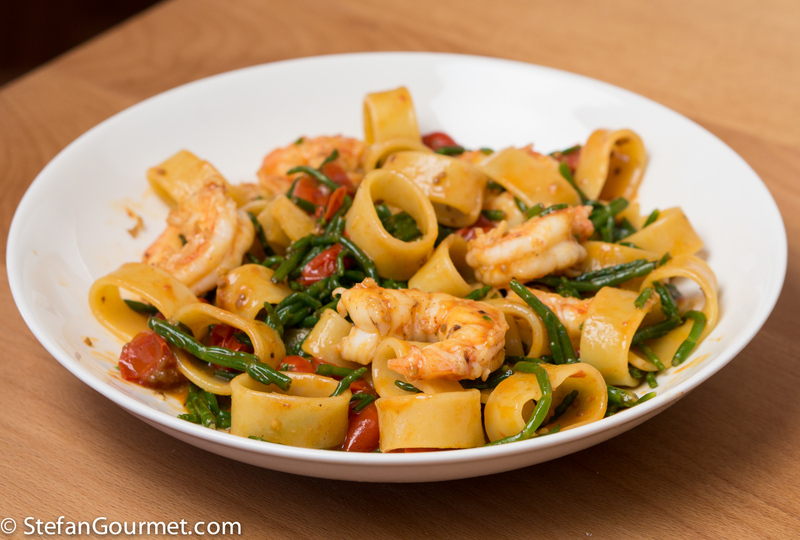 I love any dish that has pasta and shrimp although I will admit I’ve never heard of Samphire (just read it’s part of the parsley family). Also love that you make your own shrimp stock and add it to the sauce. Yum! You may also know it as glasswort. I am pretty sure the stuff I am talking about is not related to parsley. 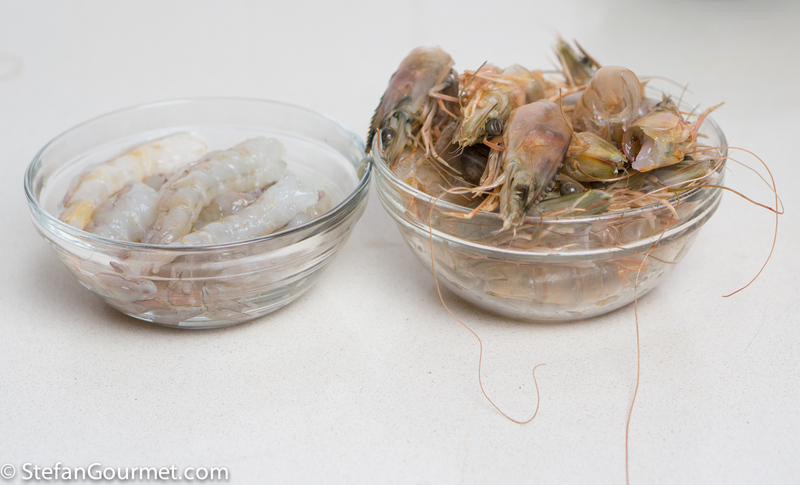 Shrimp heads and shells contain a lot of flavor and making stock is the way to get at it. Love the comment on not adding parmigiano! Never with seafood I was taught (nor with aglio-olio-pepperoncino). And It looks delicious! Very nice Stefan. Looks wonderful. We see samphire here occasionally and it’s relatively pricey. It’s called sea bean here – don’t know why. I love its salty, fresh bite. I use it in various salads because I like its succulence and texture. I never thought about cooking it. Given I have 5 lbs of shrimp in the freezer and some large penne (or farfalle), this may be dinner tonight. 🙂 Of course, I need to go to the market to see if they have samphire. 😮 Thanks. Non c’è che dire: sei formidabile nelle ricette italiane. Ti basta un suggerimento come la salicornia di Marina e realizzi un grande piatto! Lovely! Hugely humorous from my viewpoint ’cause we regard it as OUR ‘bush tucker’ 😉 ! Yes to ‘sea asparagus’ and ‘salicornia’, also swamp grass etc . . . Most Australians are still unaware of it and it basically comes from the southern coasts of about three states: not easy to buy. We normally use it raw [perhaps after some soaking to get rid of the sea salt] or barely blanched . . . daresay the consistencies, sizes etc may wary twixt the Netherlands and Down Under . . . I passed on a ‘bush tucker’ tour when I was in NT because I didn’t fancy eating maggots and such 😉 As for the size and consistency, it is the tender young stalks that are nice to eat, not the more woody bits. Masterful stuff Stefan. Samphire is reasonably readily available here. Soaking it is a great idea as it can be a little too salty. Well samphire is a new one for me in the the U.S. Nonetheless, a lovely dish!